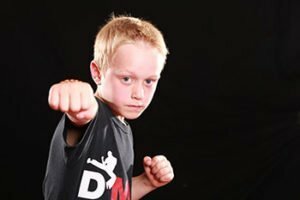 Martial Arts and Bullying – There’s no doubt a lot of kids take up martial arts as a way of defending themselves against bullies. This immediately brings to mind an image of a previously-bullied child facing up to his or her bully, subsequently putting them on the ground with a well-executed martial art move. Of course in reality things usually work out a little differently. In reality the vast majority of kids that take up martial arts for this reason never have to use any of their newfound moves on the bullies at all. Very often it is the mere presence of newfound confidence and discipline that floors the bullies. Let’s face it, most bullies are people who look for those weaker than themselves to take down. When they are faced with someone who clearly has far more confidence and poise than before, they realise what they are up against and find another victim to pick on instead. Time and again parents of previously-bullied children have spoken out about the dramatic effect the martial arts classes have had on their kids. The bullying has stopped, usually in the manner described above, and their kids have ended up feeling more confident, more settled and much happier as a result. They can defend themselves physically if need be, and that’s good to know, but this isn’t actually the most important or profound aspect of their transformation. People will probably continue to focus on the physical aspects of martial arts as long as classes are available. It’s understandable, as this is the part we can easily see. However the mental side of things is arguably far more powerful. This is harder to see when you look at a person, but when you see how they behave and approach life you’ll see the difference. When kids take up martial arts, the effects can indeed be far-reaching.